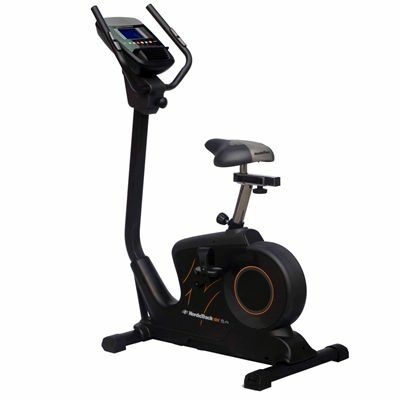 The NordicTrack GX5.4 exercise bike looks great with its black design and orange highlights and will sit nicely in all homes. But the bike offers more than just looks, with performance to match. 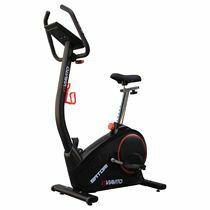 The 10kg (22lbs) flywheel delivers a smooth and enjoyable cycling experience and there are 22 digital levels of computer controlled Silent Magnetic Resistance which allow you to turn up the intensity and train. The 24 personal trainer workouts give you options to vary your exercise sessions on the bike which is also compatible with iFit technology (subscription optional) to take your riding experience to a whole new level. The 5” LCD backlit console displays your stats as you cycle, including your heart rate which can be measured by holding the hand grips or by wearing the included chest strap. Enjoy the comfort of the oversized seat and extra wide pedals, both of which are adjustable to suit each user. And the GX5.4 also boasts a cooling fan and a music port with speakers which are nice extras to have. for submitting product review about NordicTrack GX5.4 Exercise Bike.